I have seen a good handful of movies more than once in the theater, but it's not a common thing, for many reasons. But there is only one that can be the one I've seen most. One that stands above the rest as the film I watched nearly into the double digits before it left the big screens. Part of that was the dollar theater that I could ride my bike to that played it forever, but part of that was that I loved it and its soundtrack. And today, I share which film that was with a heavy heart. This one hurts, folks. 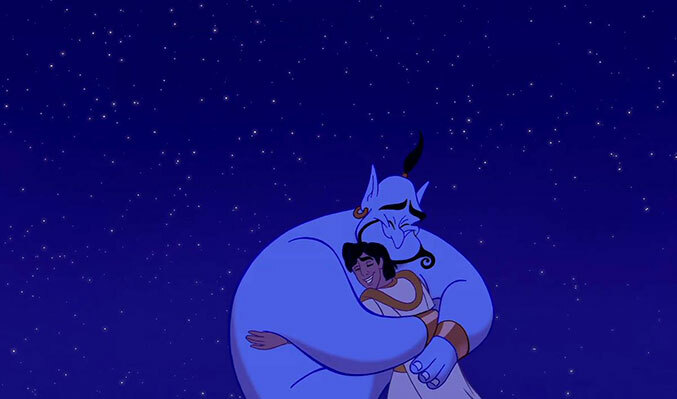 But, Genie, you're free. Rest in peace, Robin. Another film that makes the list of seen many times before it came home with me on VHS and then was one of the few replaced on DVD was seen at that same theater, and was central to a one of those "you had to be there" stories from high school. That one was Hook, which is still one of my favorite movies, and to anyone who disagrees, I say, "you lewd, rude, crude, hunk of pre-chewed food, dude!" And then there's Dead Poet's Society, which influenced me more than I can say as an adolescent when I first saw it and was a regular friend in college. It resulted in me memorizing and keeping a plaque of a certain poem in my room for years. I realize films are not the result of one person, but rather a collaboration of many, and that without many, they do not succeed. They do not inspire without everyone playing their part. But finding the right person to fit each part is the key to so many things, and Robin Williams was integral to these films in ways that made him irreplaceable. In fact, I said it as a teen, and I'll say it again: only one man could play Peter Pan. I stand by that, and I'll miss Robin Williams and his zany, wacky ways (Mork was one of my first loves, and Good Morning, Vietnam will always be a favorite, too - so many films and stand up routines and TV shows I loved had this man in common), but this post is about more than that, because the fact that Robin Williams apparently committed suicide hurts a lot, because suicide is truly horrible. I hate it. It hurts more than any other kind of loss, because you always wonder if you could have saved the victim. You wonder if you could have said something or done something or somehow gotten them help and they would still be here if you had. You never stop wondering. You grieve, and you eventually recover, but you never stop feeling like somehow, it might be your fault. And you always wonder, "what if they'd just gotten help?" Fact is, if they had (and it's hard, I know), they might still be here. And so I urge any one of you out there who might have demons of your own to fight to talk to someone. To try to get help. Please. You're my friend, and no one gets to hurt my friends if I can help it. Even themselves. Hang in there, folks. It's a rough world we live in, and we all need help sometimes. If you do, let us know. Please. In fact, I said it as a teen, and I'll say it again: only one man could play Peter Pan.